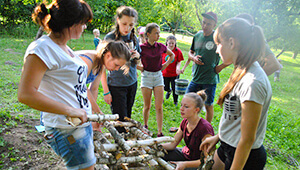 In Ukraine: SGA missionary pastor Ruslan Mandzyuk reports that while reaching teens with the Gospel may take more effort, it is not impossible! The warmest greetings to you in the love of our Lord and Savior Jesus Christ! Thank you very much for continuing to pray for the ministry of our family in Pochaev, Ukraine. The past time was very busy and blessed. My goal is to develop an effective youth ministry. For this, weekly Bible study meetings were held. But besides that, we had many personal conversations with young people. They constantly have many questions about faith in God and how to apply it to everyday life. After all, they have so many plans and desires. Rather, these plans for them have their parents. Right before we wanted to start the youth ministry of our church, we met with a new problem. Young people are growing up and enrolling in colleges in other locations. There are three young people who went to study at the local academy, and after it they intend to go somewhere further. At first, it disappointed me. For even the sister, who was baptized last year, thinks about the future prospect of moving to a big city. Later I talked to other ministers from small towns and realized that they were in a similar satiation. Young people are hard to keep in a small town … if only they will feel the call of God to stay at home. This made me look at the concept of youth ministry. Before that, I laid great hopes on it, hoping that it would become the driving force of our church. Now, I realized that the youth ministry is a conveyor. Young people will come and go. Only some will remain. Therefore, it is possible to carry out various measures with them, but it may not be possible to have a long-term ministry with the same young people. This, in turn, made me once more pray for the initiation of family ministry in Pochaev, but to begin a little later on. As part of our work developing a youth ministry, we were able to hold two summer camps again: for children and teenagers. In 2018 we had a lot of people. Young people had been recorded in the camp for 1.5 months in advance. 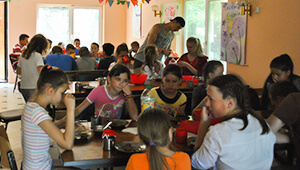 The children’s camp took place from June 25-30. 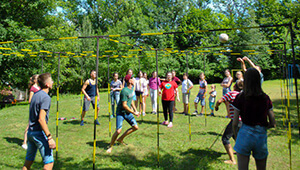 And the youth took place from July 3-9. The camps were extremely blessed. 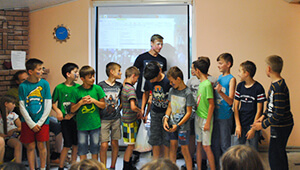 Not only that the children were happy, but also the fact that parents came to us every day. Over the past few years, the attitude toward us has changed. If we had been previously considered to be sectarians, then for them we became “Baptists.” Parents brought the products for the camp. One of the parents offered a van to bring the children to the camp and take them home. Another father brought to the camp a quad bike with a full tank of gasoline and left for two camps. With other parents we built friendly relationships. The teenage camp was more difficult, but we were expecting this. Not so much because of the youth themselves, but we realized that the teenage years are a time when young people make a choice in their lives. Therefore, the devil will set various obstacles to the perception of the Gospel and so it was. I was amazed at the fact that children from the age of 12 almost do not believe in God. If in the children’s camp I saw a sincere faith, then in the teenage camp it remained only religious behavior and skepticism. But despite all of this, these children had chance to watch us and see an example of true faith. There was a very interesting story in the camp. A boy came to us whose name is Mark. During the whole camp, he was disrespectful to us. So knowing that he and his friends smoke, at the beginning I decided to talk with them. They assured me that they knew where they were going and that they did not take cigarettes with them. But on the second day they were caught with cigarettes. This gave us a new opportunity to show love and talk to them. In addition, they rebelled during the morning exercises. Even when Bible lessons or evening gatherings were held, it seemed that they did not listen. In the extreme, they showed it with all their looks. But on the last night, Mark especially misbehaved. He hit another boy who was smaller than him and, moreover, had a birthday that day. It made me very angry. At first, I scolded him, but then called him for a conversation. That night we spoke for more than four hours. It turned out that Mark’s behavior was caused by a rebellion against his father. When we continued to talk with him, I saw that Mark watched closely all that was happening around him in the camp and what our team was talking about. He saw that we not only taught about God, but we also believed in what we taught. During the conversation, he asked many questions about God, the Bible, and Christ. And as a result, he expressed desire to come to our after-camp youth meetings. Please pray for God’s continued work in Mark and in the hearts of young people like him. 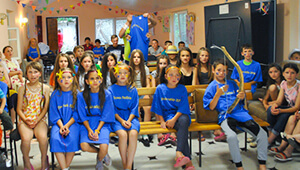 Your support for SGA-sponsored summer camps will help Pastor Ruslan’s camp and 398 others that we are preparing for now. Our goal is to reach 30,000 children and youth in our 2019 summer camps. Your gift of just $41 will make it possible for a child to attend camp … and hear the Gospel!